Customer experience strategy encompasses of action-oriented plan and processes which once executed helps organizations to maximize their customer's lifetime value. A well-executed customer experience strategy can help increase customer satisfaction, reduce churn and skyrocket your revenue. 81% of companies expect to compete mostly or completely on the basis of CX in 2019 - Gartner. The definition of customer experience goes like this - The sum of all interactions between a customer and an organization can be collectively termed as the organization’s customer experience. It is inclusive of the process of discovery, initiation, purchase, service, and advocacy. Every stage of a customer’s experience with an organization affects his/her loyalty and how he/she contributes to conversations about the organization both online and offline. For instance, if you surprise customers by going above and beyond (here it’s delivering earlier than promised), they are likely to be expressive about their excitement and gratitude. In a survey conducted by Oracle, 74% of senior executives said that customer experience affected how enthusiastic customers were about being brand advocates. A study by American Express revealed that 60% of the participants were willing to pay more for better customer experience. Research conducted by Bain & Company uncovered that 80% of participating companies believed their customer experience was great, while only 8% of their customers agreed with them. What is called as great customer experience? The definition on broad-level talks about only one aspect of customer experience which is interaction, however, while working with many SAAS based companies, we realized that it's not only about interaction but also about availability ( Touchpoints ) and the depth of interaction and impression ( engagement ). 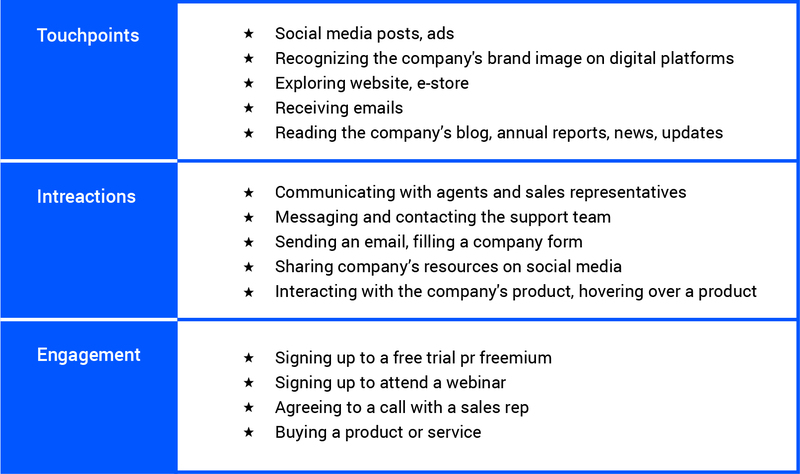 The time a customer comes in contact with your brand, employee, messages, and product across different channels and devices. The communication process between your customer and your employees. Where your customers are taking action and how well your employees are engaging them. So when your agent is able to score well at every phase of the customer experience process, it can be considered as a great customer experience. 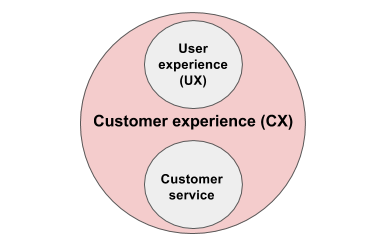 How CX differs from user experience and customer service? User experience and customer service are two aspects of several elements that make up the customer experience. User experience refers to the interactions that app or website visitors have with your software, while customer service refers to the support that organizations provide customers with issues. What are some ideas and ways to create great customer experience? Customer experience is interchangeably used as customer service experience, this simply means the kind of services you provide to your customers defines the kind of experience they are having. It isn’t very hard to create the right customer experience strategy for your business. Most businesses simply ignore customer experience or look at it the wrong way. The following are 14 ways to get your customer experience strategy right. To create the best customer experience, you have to first understand your customers - who they are, their motivations and concerns. If your organization wants to deeply understand customers and empathize with them, you need access to in-depth intel. Profile the types of customers your customer service team deals with every day. There’s no better way than this to understand customer’s needs. Once you have enough information, you can create buyer personas. The most effective buyer personas represent real people, human beings, so you can account for emotional or psychological elements that can hugely impact your customer experience. For instance, yours could be Jack, a 32-year-old man who’s saving to buy a car. Spotify’s campaign is a good example of how you can apply buyer personas. 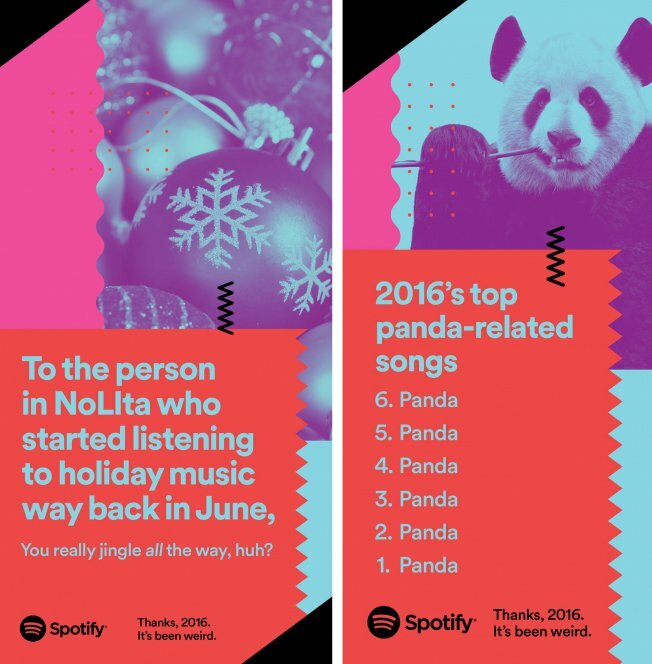 Knowing exactly who their audience was, allowed Spotify to create a campaign tailored to speak to them in a familiar voice like a friend might. Proper and deep analysis of your business mission, vision and processes is the beginning step to realign the workflow with a successful CX strategy. Get the proper understanding of your business objectives and set business priorities based on current business scenarios. Build a customer experience strategy that fulfills customer experience goals and makes the customer happy. Customer experience management really can improve your business processes and help to achieve business goals. Ask yourself that the main motive of your business is to win new customers or whether your business is entering new markets or you are launching new products/services into the current one. A proper strategic plan will be made based on the above scenarios. Review brand studies properly and this will help to make necessary changes where improvement is needed. Restructure goals to create long-lasting values through a CX strategy. Identify the barriers and how CX strategy will help to achieve the objectives. Knowing your mission, vision & processes will help in identifying answers to the core questions. What new technology, people or processes are needed to fulfill new objectives through Customer Experience strategy? Where do gaps exist between customer experience and customer expectations? How good is your company’s internal process to support customers? Which tools can be used to improve customer experience? The answers to these questions will give a clear idea of current business scenarios and what improvements or changes are needed for better customer experience. When planning your customer experience, it’s easiest to work backward. Apple is known for its premium customer experience, and for obvious reasons. Steve Jobs, who was responsible for the brand Apple grew to be, famously advocated his principle of “beginning with the customer experience and working backward to the technology”. List your brand’s customer experience stages and places where you have an opportunity to make an impression. Try and showcase your USP using these opportunities. For instance, with Amazon, it’s delivery earlier than promised. Focus on utility and solving real problems, instead of obsessing with features or superficial elements. When designing your customer experience, even the smallest of problems count. Fiverr autofill fields on search forms so their users don’t have to refill them each time. Developments as small as these can have the biggest of impacts on customers. At the other end of customer interactions with your brand are employees, who are key to creating a great customer experience. Damien Peillon, from Logogenie, is obsessed with details. His employees are trained to pay attention to customers and pick up on the slightest of details. If a customer happens to mention a birthday when reserving tables, the manager pays a visit to the table and extends wishes to exactly the right person. If an employee overhears a customer expressing their likes or dislikes for something, every staff member is intimated to take necessary actions. Danny Meyer believes in hiring the right people to enable such a customer experience. Focus on the skills that matter - interpersonal skills, the ability to interact and connect with people, presentation, hospitality and the ability to maintain a cool mind through crises. Create a set of principles for your customer executive and sales personnel to follow, so their interactions with customers are smooth and pleasant. As discussed earlier in the article, the user experience (UX) is a large part of the customer experience. The design of your website and app matter, but so does the complete design of your customer experience. The important question isn’t which channel the customer is coming from anymore. Customers are pouring in from multiple channels, all seeking solutions from your brand is just one bad experience away from leaving you forever. By planning every stage of the customer experience - from discovery to purchase and advocacy - you retain more control over how it appears to customers. Create a consistent brand experience across channels - your website, apps, email, and social media channels. For instance, Etsy’s orange and white theme is consistent across all their channels. Eliminate unnecessary hurdles and ensure that customers are always placed on the shortest path to any goal; be it purchase, seeking information or service. Factor in irrational, emotional satisfiers. For instance, from building app Wufoo had emotions on their contact form for a period of time. 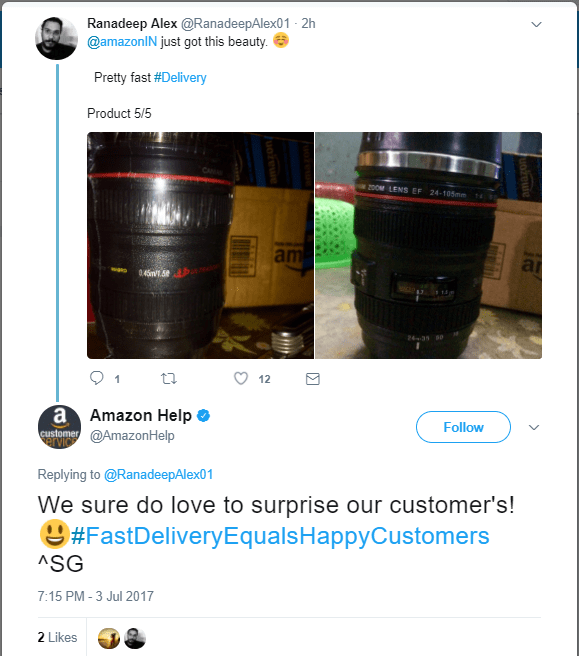 Their form would ask customers how they were feeling on a scale of the largest smiling face to the grumpiest of emojis. This addition drastically sobered up their incoming customer support emails and left customers feeling more attended to and satisfied. Let’s revisit the Bain & Company research we discussed at the beginning of this post. 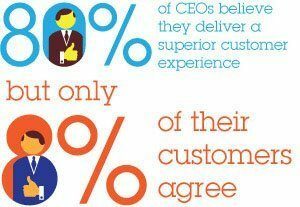 80% of companies, who believe they are providing great customer service, have only 8% of customers who agree with them. So if you think you’re an 8/10 in customer service, you’re not even half right. How do you know what your customers’ needs are if you don’t ask them? How can you assess what your brand’s value is if you don’t ask your customers? Use post-interaction, real-time feedback surveys. You can even follow up with customers over the phone for more details. Pay attention to what is being said about you on social media, this is where customers are usually the most honest. If you pay close enough attention, you will hear customers giving you actionable feedback, telling you exactly what they want. Do a proper analysis of your competitors, current market threats to get a clear idea of business and your customers. Use both internal and external processes to get an overview of the market environment and competitors. This analysis will help to know where improvements are needed to overcome the gap between the current position and competitors. The very next step is to do a deep analysis of the current state to create strategic goals and objectives that will help in implementing a successful CX strategy. These goals and objectives will focus on competitive threats, market issues, and the opportunities discovered throughout the strategy project. Once you have taken stock of all interactions and feedback with customers, you can build an efficient resolution system to satisfy customers’ needs. Ideally, every unsupported stage in the customer lifecycle should have an unobtrusive support system in place. The best way to do this gives your customers and prospects control. Instead of forcing your support on them, show them that it exists and that they can access it easily when needed. Live chat platforms like acquire can be convenient communicators for prospects and customers when they are browsing your website. This form of support is not only unintrusive but welcome for visitors who need queries answered quickly when browsing your website. Quick resolution of questions can improve a prospect’s perception of your brand and even prompt a purchase. Plus, with a platform like acquire that offers video-based assistance, your prospects will feel cared for on a personal level. Social media support isn’t an option anymore. With more customers taking to social platforms to vent frustrations and seek information, it’s crucial to have a support executive active on social at all times. Traditional feedback forms still serve their purpose in connecting customers with brands. You can even use the space on feedback forms for humor and fun, to break the ice with people before they contact you. Here’s a simple form with a GIF that can put a smile on your visitor's faces. Even if your customer experience is great, you risk losing customers to brands that are more memorable, spunky or have an intangible quality to them. For instance, there are several smartphones that can rival the iPhone in the market, but Apple remains the only smartphone manufacturing company to make an actual profit every year. Why? Because it’s special belonging to the Apple family. Apple already has a massive, loyal customer base. If you want to create an unshakeable image for your brand in your industry, you have to create a memorable brand personality. Think Charmin. Taco Bell. Old Spice. More than 6 out of 10 U.S customer says that they prefer a digital self-service tool like a website, mobile app, online tutorial for resolving their daily issues than a call or video chat. With AI you can auto-respond to routine customer queries and guide your audiences with highly curated content. Persistent use of AI during customer service interactions reduces the need to attend every customer conversation and helps your agent to focus on complex issues. AI enables you to segment your user base and help you send personalized. On a micro-level AI records a subscriber’s email browsing data, web pages they visit, past interactions, so that you can auto-send personalized messages and even track their response. While you are addressing a customer request, AI shows you his past interactions and journey with your product/service in one single window, helping you to be contextual across various touch points. 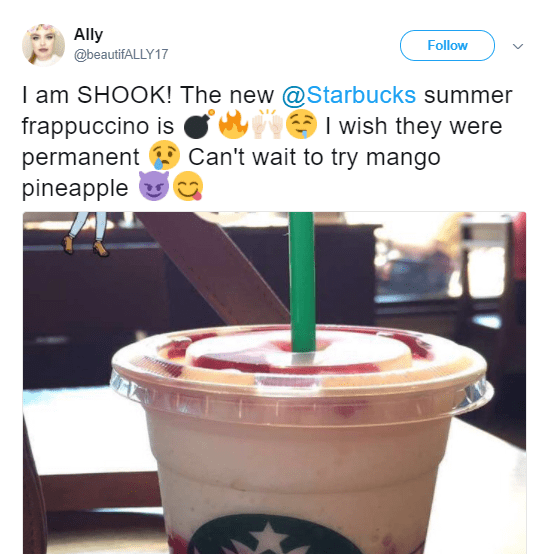 Marketing process includes educating your customers on the benefits of your product and service and slowly pushing them forward to buy your product/service. However, with digitalization, customer’s thought pattern and decision-making process have drastically changed. They already do their part of the research before reaching out to you. They are aware of the featural advantage or disadvantage of your product/service, this is where customer service becomes a key differentiator. Customer service helps you build a brand image, this is an excellent way to assure customers that you are not just here to sell but to help them out with their business in every possible way. It's simple if you cannot measure it, you cannot improve it. If you are not monitoring or measuring your customer experience, you are missing out on a lot of valuable information like your agent’s average response and resolution time. However, It's just not the front lines who affect the customer experience it's a lot of people behind the scenes that affect the experience the customer is having with your team. So it's important to note here that just tracking or measuring your frontliners or customer facing team’s performance won't give you detailed information about customer experience. NPS - Net Promoter Score - NPS is the percentage of your customers who would—or wouldn’t—recommend your company to their friends, family, or colleagues. CSAT - Customer Satisfaction Score (CSAT) is the most popular transactional metric - This metric help you ask a customer how satisfied they are with a recent interaction–often a purchase or a customer service call–on a rating scale. CSAT is flexible and highly customizable. CES - CES helps you determine the effort required by your customers to accomplish a task, like getting a support request handled or finding the product they were looking for. In 2008, only 12% of businesses were using a cloud-based Customer Service Management Tools - The figure has now increased to 87%! More and more companies are considering to adopt specialized customer-centric tools as it has been recorded that such tools reduce the workload of an organization by 67% and also make the current customer-centric processes more efficient and reliable. -> It can help you engage customers across multiple channels by bringing multichannel conversations in one place. -> Help you increase customer engagement by automatically sending personalized messages to customers/visitors based on their profile. -> It helps optimize customer interaction and reduce churn rate by defining the next step at every stage of the customer journey, with predictive analytics. -> Help you measure your customer experience strategy in quantitive terms. Once you have made customer experience strategy, executives can focus on where still improvements are needed. Customer Experience Strategy is an ongoing process. Executives can measure and can regularly optimize efforts. Analyze small minute details to make the customer experience better. Keep yourself in place of customers and gather information regarding brand experience, design, product usage, etc. Give proper training to customer executive about your products, how to deal with customers queries and motivate them to become customer-centric. If your brand was a person, what kind of person would it be? Customer experience is one of the biggest opportunities that businesses have to capture prospects’ interest, get them to act and stay with the brand as loyalists. There is no limit to what a good customer experience strategy can enable, and this post is a great start. How Live Chat Can Help Online Insurance Companies To Increase Sales By 100X?